Fragokastello, is situated in the area of Sfakia the south coast of west Crete and might be a small seaside resort but still offers the traveler everything. This small village in the south of Chania region in Sfakia province will make your holidays unforgettable as long as you visit the big Venetian castle, and the beautiful Fragokastello beach that are the two essential things to see when in the area. The venetian castle by the same name along with the area's beaches and the amazing and of diverse beauty scenery will take you to a whole different place. Apart from a great variety of rooms and apartments to accommodate you,Fragokastello offers you plenty of chances to enjoy original cretan dishes at one of many restaurants and taverns serving all kinds of greek delicacies. Families with their children will find here all they need: all the basics to ensure a comfortable holiday in Crete with the most peaceful and quiet surroundings. Offering all types of facilities like sunbeds, umbrellas, cafe, toilets, etc without feeling overly touristy, the beach of Fragokastello is ideal for those looking for crystal clear and shallow waters in a beautiful scenery offering you the tranquility that you need. The beach is sandy and since it is situated on the Southern part of the Island, you will find there your peace of mind if you don't like crowded and touristic places. Fragokastello beach and castle are the most surprising and exciting things that you will not forget from your holidays in Chania! A magnificent beach, an astonishing Venetian castle, and a place of legends is waiting for you to discover its unique beauty. Fragokastello village got its name from its Venetian Castle. The castle, built in the 14th century from the Venetians, was called “Castel Franco” and still manages to capture everyone's attention and admiration! 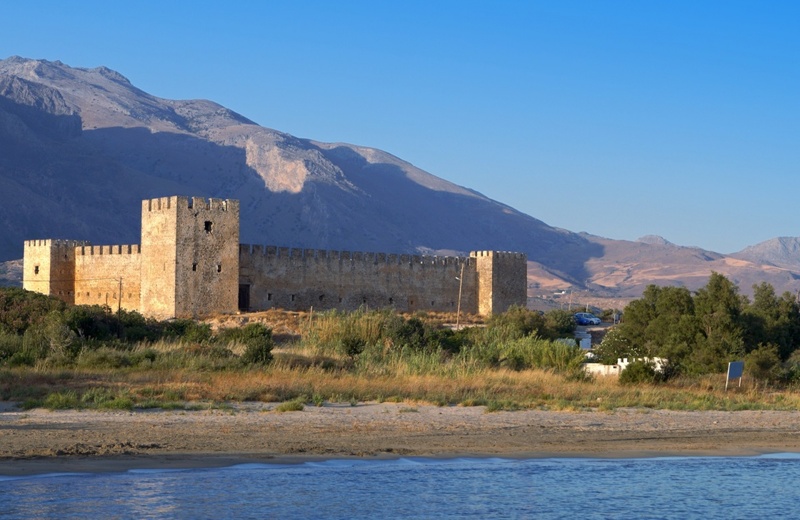 The castle in Fragokastello, built to protect the surrounding area from pirates, but also in order to enable the Venetians to control more efficiently the local population, is an attraction that you have to see if you wish to feel the area's magic and see Crete the way the locals do! Find information about selected Hotels, apartments and rooms in Fragokastello to choose the perfect place for your accommodation.